a contributor to pediatric asthma, a major problem among Denver’s children. the single most powerful tool to improve health in Denver. Denver Health is a comprehensive, integrated health care system providing care for all, regardless of ability to pay, and it serves as a model for other safety-net institutions across the nation. Twenty-five percent of all Denver residents, or approximately 150,000 individuals, receive their health care at Denver Health, including one in three children in Denver who are cared for by Denver Health physicians (Denver Health, 2015c). Denver Public Health (DPH) is part of the integrated Denver Health system, and stands at the forefront of public health activities in the City and County of Denver. The overarching mission of Denver Public Health is to promote, improve, and protect the health and well-being of the residents of the City and County of Denver and beyond. Like other urban core areas, Denver County has high numbers of people living in poverty, with low educational levels, from racial and ethnic minorities, and with limited English proficiency. The Ask, Advise, and Refer (AAR) intervention was initiated in DPH’s Sexual Health and Family Planning Clinic in late 2012 and revealed that approximately 37 percent of patients reported smoking (Mickiewicz, 2013). The initiation of this program in the clinic provided the groundwork for continued implementation in Denver Health’s Community Health Service (CHS). The CHS clinics are Denver’s largest federally qualified health centers (FQHC). CHS clinics manage more than 365,000 outpatient visits annually. The clinics and outreach services serve as the safety-net health care provider for Denver’s most vulnerable populations often at risk for tobacco use. In 2010, approximately 11,000 (28 percent) of adult outpatients at Denver Health CHS clinics reported being a current smoker, compared to 21 percent of Denver adults as a whole, thus making these clinics an ideal site for intervention (BRFSS, 2010). Although current tobacco use was recorded in the electronic health record (EHR) system, provider advice and referrals were not documented, thus disallowing program staff to determine if the AAR components of a comprehensive cessation treatment were being offered. Based on these factors, the AAR program was initiated at Denver Health CHS clinics in order to address the high smoking rates and inconsistency in advising patients to quit and referring patients to cessation services. In September 2012, the DPH Tobacco Team was awarded Amendment 35 funding (a voter-approved tax increase on cigarettes and other tobacco products) to implement evidence-based comprehensive cessation treatment within CHS clinics (CDPHE, 2012). To develop the AAR program, the DPH Tobacco Team and CHS engaged in a series of coordinated steps to bridge health care and public health to address tobacco use. These coordinated steps included identifying tobacco prevention champions to lead the hospital-wide initiatives that involved implementing health systems and policy changes to ensure tobacco cessation was consistently integrated into health care delivery. The system-level changes followed the Agency for Healthcare Research and Quality’s (AHRQ) strategies, which include implementing a tobacco-user identification system; providing education, resources, and feedback; dedicating staff to provide tobacco dependence treatments and assessing delivery of treatment in staff performance evaluations; and promoting hospital policies that support and provide tobacco dependence services (AHRQ, 2012). These identified tobacco prevention champions, supported by the DPH Tobacco Team, led the initiative within CHS recruiting additional staff to participate on a newly formed Denver Health Tobacco Intervention Committee—an ambulatory quality improvement (QI) committee that addressed overall system change efforts, the EHR reports, staff trainings, resources, and clinic feedback. To implement a tobacco-user identification system, the Tobacco QI Committee and DPH Tobacco Team collaborated with Denver Health’s eHealth Services (eHS) information technology staff to modify the EHR to include structures to support implementation of the AAR intervention at every clinic visit. A standardized Colorado QuitLine (COQL) fax referral form was modified allowing referral numbers to be electronically monitored by the Tobacco QI Committee. Additionally, eHS staff and the Tobacco QI Committee developed CHS Tobacco Clinical educational and usage reports to accurately measure the percentage of smokers seen at each clinic and whether smokers were advised and referred for treatment. These reports allowed appropriate clinic-level and provider-level feedback on how they were addressing tobacco use, and they helped identify which clinics and providers needed additional support in advising and referring their patients. Further, the Tobacco QI Committee and DPH Tobacco Team collaborated to administer a survey with relevant CHS staff to complete questions about processes around tobacco use and referral services including documentation, types of referrals, billing, interest in tobacco-related activities, and contact information. Responses from the surveys helped to identify and train dedicated clinic staff to provide tobacco dependence treatments. Educational trainings were provided for clinic staff on AAR, the COQL fax referral processes, and required EHR documentation using lectures, workshops, and in-service trainings. An effective approach to inform staff on the new processes being initiated to address tobacco use and secondhand smoke exposure included developing an eye-catching comic educational flyer. Tobacco cessation resources were provided to staff and included Colorado Quitline resources, Denver Health cessation resources, and information on effective cessation medications. Collaboration also occurred with the Denver Health pharmacy department to include tobacco dependence treatments (both behavior-based interventions and medication) in their formulary. Additional collaborative efforts updated policies, such as Denver Health’s tobacco and smoking policy, which focuses on electronic vaporizing devices (e-cigarettes, e-hookahs, marijuana vapor pens, etc. ), marijuana, and nicotine replacement therapy (patch, gum) availability, and the clinical care guidelines for tobacco cessation. Collaboration among the DPH Tobacco Team, eHS staff, and the Tobacco QI Committee resulted in more than two dozen health system changes. Policy changes included updating Denver Health’s tobacco and smoking policy, the clinical care guidelines for cessation treatment in CHS clinics, and revising the COQL fax referral form. The original fax referral form took providers approximately 5 minutes to complete; the standardized form now takes less than 1 minute. 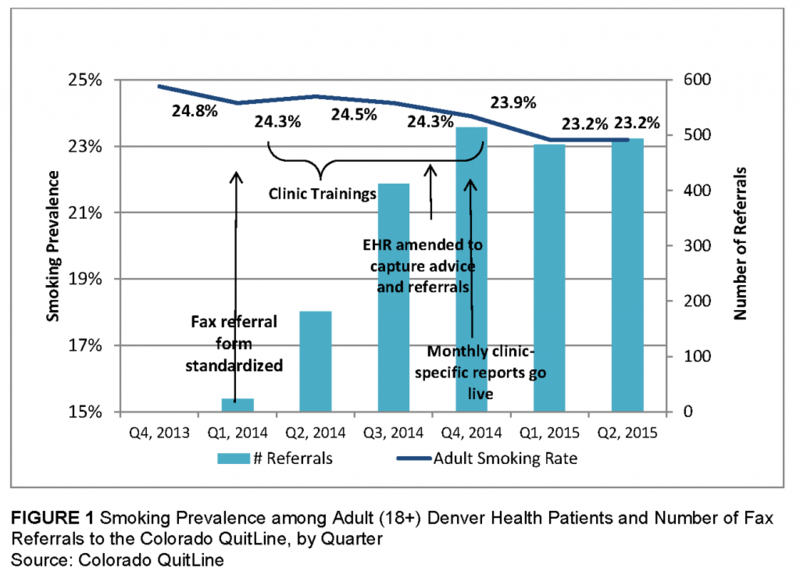 Figure 1 provides adult smoking prevalence and increases in fax referrals to the Colorado QuitLine after the form was modified. In 2013, a clinic survey was sent to 64 CHS staff, eight surveys per clinic. Thirty-six (56 percent) surveys were returned by five of the eight clinics. Most respondents reported that clinic staff asked, advised, and referred with about 75 percent reporting that information was documented in the EHR. All respondents reported that providers at their clinics referred tobacco users to the Colorado QuitLine with only 10 respondents out of 36 (28 percent) reporting that providers followed up with their patients. Most respondents—24 (67 percent)—were interested in training in AAR, and 13 respondents (36 percent) were interested in participating in tobacco-related activities. Based on feedback provided by the survey, a standardized approach to training was developed and implemented in all CHS clinics, and more than 275 staff members were trained in AAR by the DPH Tobacco Team and tobacco prevention champions. Approximately 49,000 unique adult patients are seen in the clinics each quarter. Rolling annual averages for smoking prevalence rates are defined by the last tobacco use status documented in the EHR. Prevalence rates decreased from 24.8 percent (October 2013) to 23.2 percent (March 2015), a reduction of 1.6 percentage points (approximately 780 patients) representing an overall rate reduction of 6.5 percent. Process indicators allowed a more detailed determination as to how the implementation steps contributed to the decrease. When clinic staff were trained in late 2013, there was a small increase in the number of referrals in the first quarter of 2014 (24 referrals); however, implementation of the standardized fax referral form for the Colorado QuitLine was launched in March 2014 resulting in an increasing number of referrals: 181 in the second quarter and 412 in the third quarter of 2014 before levelling out at approximately 500 per quarter through quarter 2, 2015 (Figure 1). In August 2014, the EHR system was amended to prompt clinicians to administer and document AAR at every visit. Baseline rates of advice were slightly greater than 50 percent of patient visits in the quarters immediately following the EHR modifications (Q2 and Q3 of 2014). However, when monthly clinic and provider-specific AAR performance reports were initiated in the fourth quarter of 2014, advice rates rose to 72 percent in Q1, 2015, and 84 percent in Q2, 2015. Figures 2 and 3 display images of the “advise” field usage report (or the extent to which providers used the “advise” field in the EHR) for each clinic for November 2014 and June 2015, respectively. This program highlights the benefits of a collaborative partnership among a health care system and public health to deliver consistent and effective tobacco use assessment and treatment, maximize quit attempts, and increase successful smoking cessation. data not fully showing the effect of AAR on the system because the clinics that had not been trained were affecting the upward trends. Another barrier was creating a training module that met all of the clinics’ unique needs. The original data for tobacco use was solid, but the way it was displayed did not allow for constructive education and technical assistance for each clinic. It was also challenging to organize the training to include all the information in a simple and straightforward manner. Each clinic has a different population and potentially different priorities, so it was difficult to align the training to each clinic to allow them to integrate AAR into their specific workflow. Providing ongoing training and technical assistance has been a challenge that needs to be overcome. By creating the educational and usage reports, the individual clinics began receiving reminders, tips, and their specific performance on AAR. Working with the Denver Health QI coach was important to educate clinic staff and sustain performance. A unified training and technical assistance program was provided, and the DPH Tobacco Team and tobacco prevention champions supported each clinic in standardizing cessation services as part of their routine clinical work. Finding the best way to measure clinic success was difficult. The DPH Tobacco Team ultimately decided that measuring the “advise” metric was most important. This metric is supported by the Denver Health strategic planning process, which is focusing on tobacco cessation and particularly on adult smoking rates among CHS patients (18 years and older), referrals to the Colorado QuitLine, and secondhand smoke prevention. Integrating tobacco prevention into the Denver Health strategic plan provides overarching support by all departments within Denver Health. system. Obtaining high-level support for tobacco cessation within the overarching Denver Health strategic plan provided high-level endorsement and institutionalization for this work. 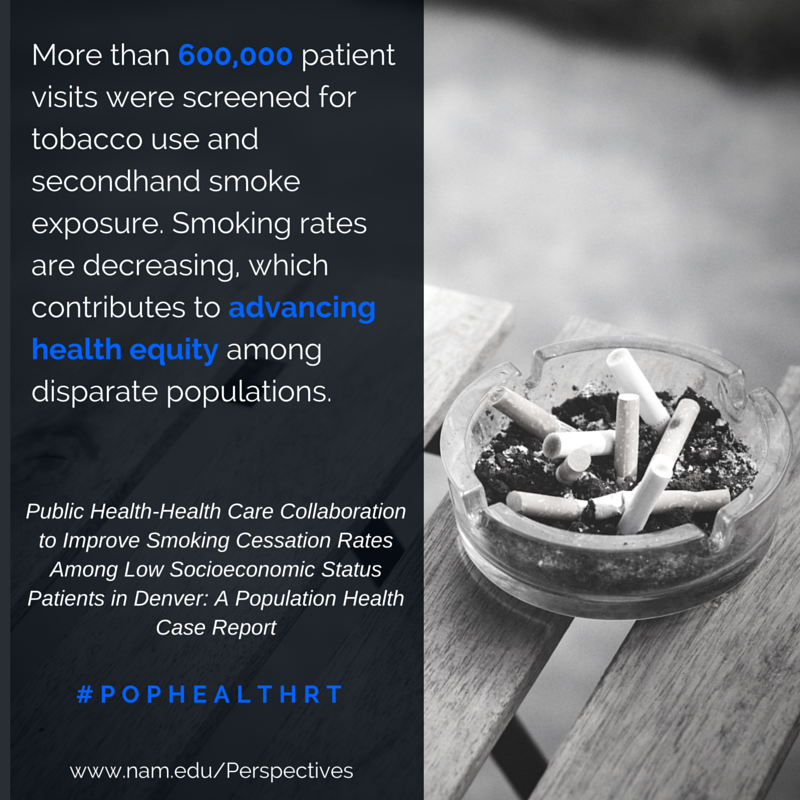 The result of all these efforts is that more than 600,000 patient visits were screened for tobacco use and secondhand smoke exposure, and providers now routinely offer cessation interventions as part of standard workup for all their patients who smoke. Consequently, smoking rates are decreasing, which contributes to advancing health equity among disparate populations. AHRQ (Agency for Healthcare Research and Quality). 2012. Systems change: Treating tobacco use and dependence. Rockville, MD: Agency for Healthcare Research and Quality. http://www.ahrq.gov/professionals/clinicians-providers/guidelinesrecommendations/tobacco/decisionmakers/systems/index.html (accessed June 28, 2015). BRFSS (Behavioral Risk Factor Surveillance System). 2010. Colorado Health Information Dataset (COHID). Denver, CO: Colorado Department of Public Health and Environment. CDPHE (Colorado Department of Public Health and Environment). 2012. State Tobacco Education and Prevention Program. Task Order Contract Routing Number 13 FAA 00014. Denver, CO: CDPHE. Denver Health. 2015a. Tobacco control, prevention, and education (2015). Denver Public Health Web site. http://www.denverhealth.org/public-health-and-wellness/publichealth/community-health-promotion/tobacco-control-prevention-and-education (accessed July 6, 2015). Denver Health. 2015b. Secondhand smoke. http://www.denverhealth.org/public-health-andwellness/public-health/health-promotion/tobacco-control-prevention-andeducation/secondhand-smoke/ (accessed July 6, 2015). Denver Health. 2015c. About Denver Health. http://www.denverhealth.org/about-us (accessed July 11, 2015). Denver Public Health. 2012. Health of Denver 2011. Denver, CO: Denver Public Health Department and Denver Environmental Health Department. Mickiewicz, T. 2013. Public Health Quality Improvement Exchange. Implement a systematic process to deliver and document a brief tobacco cessation intervention to all clients seeking family planning and sexual health services in the Denver Metro Health clinic. https://www.phqix.org/content/implement-systematic-process-deliver-and-documentbrief-tobacco-cessation-intervention-all (accessed July 15, 2015). Tracey A. Richers Maruyama, M.A., is a Public Health Planner providing support for the chronic disease tobacco control program in the Health Promotion Division at Denver Public Health. Theresa Mickiewicz, M.S.P.H., is an evaluator and epidemiologist providing support for chronic disease prevention activities at Denver Public Health. Ava Cannon, B.B.A., is a Health Program Specialist focusing on health systems change and cessation work with the Chronic Disease Tobacco Team at Denver Public Health. Teddy Montoya is a Health Program Specialist focusing on health systems change and smoke-free multiunit housing policy implementation with the Chronic Disease Tobacco Team at Denver Public Health. Santos Diaz, M.B.A., is a Program Coordinator focusing on cessation, youth access, and smoke-free multiunit housing policy implementation with the Chronic Disease Tobacco Team at Denver Public Health. Erica Berg, M.P.H. is a Health Program Specialist focusing on cessation and smoke-free multiunit housing policy implementation on the Chronic Disease Tobacco Team at Denver Public Health. Daniel Kortsch, M.D., is a Family Physician at Denver Health and an Assistant Professor of Family Medicine at the University of Colorado School of Medicine. Ali Zirakzadeh, M.D., M.S. is the Denver Health Smoking Cessation Champion and Assistant Professor of Medicine at the University of Colorado School of Medicine. Judith C. Shlay, M.D., M.S.P.H. is the Associate Director of Denver Public Health and a Professor of Family Medicine at the University of Colorado School of Medicine. The views expressed in this Perspective are those of the authors and not necessarily of the authors’ organization or of the National Academy of Medicine (NAM). The Perspective is intended to help inform and stimulate discussion. It has not been subjected to the review procedures of, nor is it a report of, the NAM or the National Academies of Sciences, Engineering, and Medicine. Copyright by the National Academy of Sciences. All rights reserved.